Achieving consistent high-quality live sound can be challenging. And while some people can get away with the poor sound, for performing musicians, club owners and others who need to deliver sound to targeted audience, having the best PA System on the market is imperative. If you belong to this group, here is a short roundup of top-rated products on the market. PA system, or public address system, is a system designed to amplify and deliver sound to all members of a targeted audience equally, whether in a small venue or a large complex. It is commonly used in live music performances, sporting events, and similar functions, both inside and outside. Microphones and line inputs are converting acoustic sound into electronic signals. Mixing boards and effects modules are processing and mixing those signals. Power amp amplifies the signals. Speakers and monitors are used for controlling the performance. Different PA systems will have different capabilities, features, and designs. If you want to acquire the best one for you, you will need to consider various things that could impact your decision and, in the end, your satisfaction with the product. Traditional PA systems consist of separate components for each individual function: a standalone mixing board, dedicated power amp(s), outboard signal processors, and a number of individual PA and monitors. Systems like that require a lot of space to transport, store, and set up onstage. 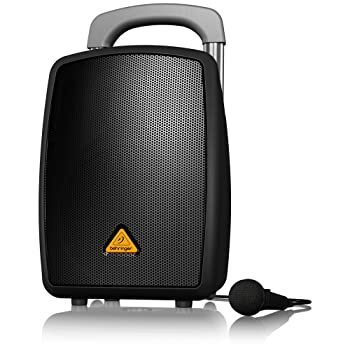 If you’re planning on transporting your PA system frequently to different venues that have modest amplification needs, there are some portable and compact PA systems that can meet those needs. There are even complete PA systems roughly the same size as a standard PA speaker. For small bands or solo acts who perform in small venues with basic amplification needs, there are also excellent all-in-one models that can deliver plenty of power. The power requirements and coverage will basically depend on the size of the venue where you are using the PA system. If you are observing that from the point of the audience, the usual rule of thumb is that the PA system should have the power of 2-watt per head. However, imagine that system in a large outdoor venue. In this case, that equation doesn’t quite make sense. With 5,000 attendees, 2-watts per head would turn out to be 10,000 watts of power amps driving speakers that may handle that power. As for the coverage, you can use various formulas that can help you calculate adequate coverage considering controlled circumstances, room shapes, the presence or absence of walls, ceiling heights, and many other factors to render the process of providing proper speaker coverage. Essentially, consistent coverage shouldn’t have more than 6dB variation in sound pressure level (SPL) from the loudest to quietest seat in the venue. Depending on your needs and specific type of public events you are into, you might need some additional gear that is usually used in combination with portable PA systems. As with any quality product, portable PA systems offer additional features and if you are willing to spend more money you can get more power, enhanced input channels, extended low-frequency response, and other conveniences such as a tuner output, and similar. You might also need additional microphones, amplifiers, etc. Is the system built so simple that you can operate it without even reading the manual? Is the set up fast and easy? Are all operations laid out in the user-friendly configuration? Device compatibility is a crucial factor to consider, especially if you are using different personal music devices and laptops. Some input and output devices/channels will not be supported by specific PA systems, and if you don’t choose carefully, you might end up with a useless product. Also, the support for various input and output channels will contribute to improving the quality of the sound. What is the best budget? There is no doubt that any quality product requires a significant investment, but, as in most areas, you get what you pay for. In the world of quality audio, this means that spending more money not only gets you better quality sound, it also provides you with something more compact and portable. A high-end system might seem expensive, but only at the first glance. An “expensive” package usually takes up less than half the space of a similar system built using cheaper components, and most likely still sounds significantly better. Spending a little more on the PA system might mean that you can take all your gear in a car, instead of a van, so factor these savings into the price. 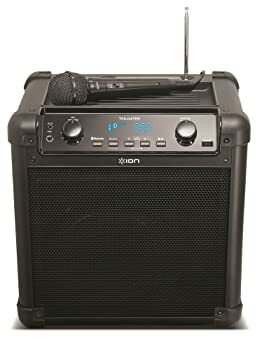 ION Audio Tailgater (iPA77) is a portable powered speaker system with a rechargeable battery. The package also includes instrument inputs, a professional microphone, and an iPod dock. It is a great all-purpose system that can be used for public addresses freely, but it is not very recommendable for audiophiles. The backbone of ION Audio Tailgater is a single 7-inch woofer with a 2-inch tweeter, powered by a 16-watt amplifier. It also features AM/FM radio with a bright display and 1/8″ auxiliary input. Although an iPod dock is a nice addition, it doesn’t offer much protection. The system is compatible with various different devices, so you should have no problems in connecting it with your laptop or smartphone. One of the biggest flaws of this system is that is very heavy, and it doesn’t help that the battery is slow to recharge, either. On the bright side, its powerful, deep and punchy sound is fantastic; it will make you feel like a superstar. It exceeds the quality you would normally find in a PA system within its price range significantly. 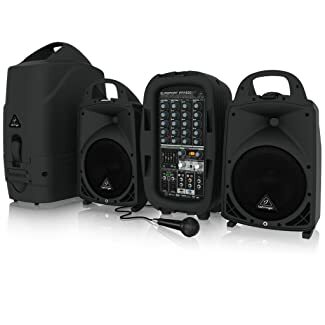 Behringer’s system is an all-in-one portable PA system with full Bluetooth connectivity. One of the first things we noticed in this system is its sleek design. But MPA40BT is more than just a pretty face. It not only looks light, it also feels light. Its high-quality sound is good enough to reach 250 people, so although it is perfect for parties, corporate events, weddings and smaller musical shows, it is not exactly something you would choose for a big event with more than 500 people. With the right-size audience, it will make a hell of a party. It is a beginner level device that can be set up really easy, with no technical background whatsoever. The speaker performs really well, but higher volume can lower the quality of the sound drastically. Furthermore, Bluetooth connection has some issues, and it doesn’t work as described every time. Behringer comes back, but this time with something much more powerful. If you thought that this 150 W powerhouse weighs as much as its strength, you’re wrong. On the contrary, B205D is considerably lighter than other compelling PA systems. The unit seems to be made to rock the house with bass and it is very loud for its size, all of which makes it perfect for bands. However, it is better for acoustic settings. It also features a vocal monitor and many versatile inputs, bringing the feel of a gentle and precise singer to another level. Besides the microphone, you can plug in two other devices, such as MPEG player and acoustic guitar. The sound is great, but it seems a little hollow. The guitar sound can be somewhat distorted. However, this problem only appears with nylon-stringed guitars, so if you don’t own one of these, you should have no problems with this system. 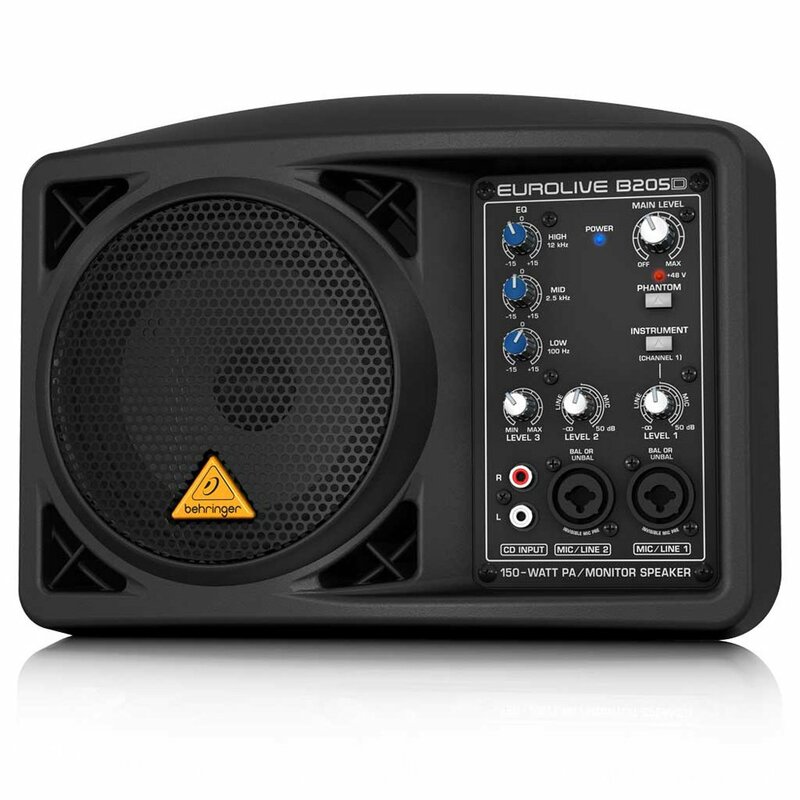 Although none of these is a bad purchase, it is obvious that Behringer Eurolive B205D excels in all the areas where it counts, so if you are looking for PA system that delivers both power and portability, this should be your go-to choice. So, let’s start with the obvious, after the previous three products 500 W seems like a really big change. Although a very powerful unit, this one weighs only 44.8 pounds, so you don’t have to worry if you carry it around for gigs and similar events. Like some previous products, it also features a Bluetooth connection, which works pretty well. The 8” woofers are very loud and powerful, and 1.35” aluminum-diaphragm compression drivers bring the thunderous sound that will tremble your heart. Also, it is very easy to set up, so if this is your first PA system ever, you won’t regret it. However, if we would have to point out two drawbacks, that would be the price and the fact that there is no 220 V option, so you would have to use a converter to make it work. All in all, it is a pretty decent product, if you are willing to spend some more bucks. Now we are getting serious. 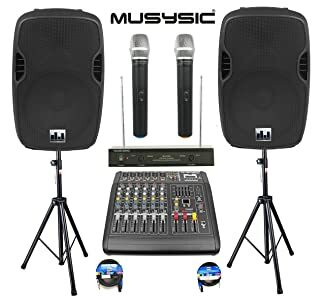 This system features 6-channel power mixer, built-in amplifier (with the peak of 2000 W), two 10″ speakers (800 W peak power, 400 W program and 200 W RMS) with heavy-duty speaker stands and dual wireless microphone system with 2 handheld mics. The sound is so powerful that you can actually set it up in an outdoor environment and reach to hundreds of people, even in a loud neighborhood or near a busy road. It is an excellent value for the money, especially if you are beginning with professional performances. Still, the plastic components feel cheap and weak, and it doesn’t seem as it can last for years. If you are an audiophile, you will probably not appreciate this system very much since there are limited options for adjusting the sound. There can be loud humming in the board, and it doesn’t produce the pounding bass you can hear in nightclubs. However, for most of the people, this is a great find. 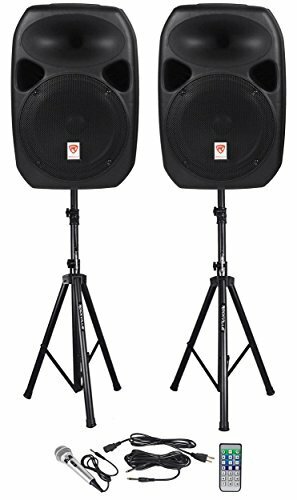 The Rockville RPG122K Dual 12-inch Powered Speakers have 12” in each woofer and also both come with stands. The speakers come with a microphone and a remote control which is very convenient. Each of the woofers has a voice coil that measures 2” and is made from aluminum so the sound is produced very clearly. Rockville also features Bluetooth connectivity and USB input. This compact and lightweight system delivers quality distortion-free sound even at extreme sound pressure level. The ergonomically shaped side handle makes it easy for carrying and setup. Both the mesh grill of the speakers and the microphone are made from high-quality steel, so you can expect excellent durability. The frequency response of the speakers goes from 60 Hz up to 20 kHz, while the microphones goes from 60 Hz up to 13 kHz. The sound from the microphone is full and robust, and it feels like a more expensive product. However, there are downsides to this seemingly impeccable product. The power cord is short and thin and most importantly, the sound gets distorted when played really loud. There is also a noticeable lack of bass at low frequencies. Each of these has its pros and cons, but if we would look from the price-value ratio, we would definitely choose The Rockville RPG122K. Some of its drawbacks, such as the short power cord, can be easily addressed, so give it a shot! Hisonic HS120B PA System with wireless microphones works great for outdoor activities when wall outlets are not accessible. 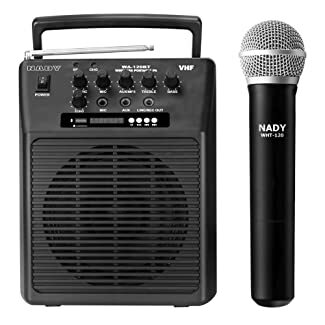 It features a combination of built-in 40-watt powerful speaker and VHF wireless microphone in one very portable package (it weighs only 6 pounds). With its high-capacity rechargeable battery, you can use it for a long time outdoors – you can rely on this one easily. 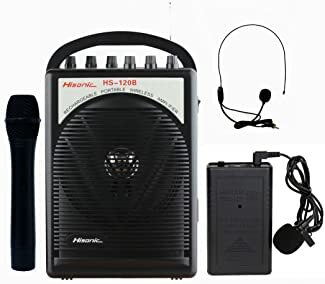 Other praiseworthy features include one additional microphone input jack if you need more than one microphone, a cassette player, and an audio input jack for playing music from personal CD players, Mp3 player or an iPod. However, the wireless headset microphone makes a lot of static and popping noises, the amplification feels not powerful enough, the sound quality isn’t great at high volumes and it doesn’t look like it can take a lot of abuse. Is it just us, or this unit looks like an oversized baby monitor? Poor design aside, the PWMA100 offers solid voice and audio output. 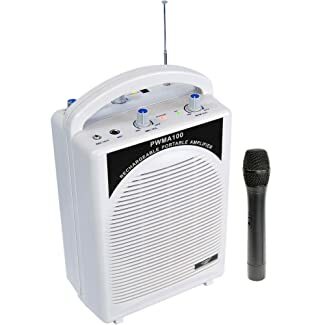 The wireless mic is great for karaoke performances and all-in-all, it is a fine picnic accessory. It weighs less than 6 pounds, but you can equip it with additional speakers. On its own, the volume feels relatively good for smaller gatherings. The design is not the only drawback of this little one. Sure, the price should tell you that you won’t get a durable product, but you would at least expect to get more than one mic input and a bit better sound from the speaker. Well, you won’t get either of those. So, 20 W might not sound so great when compared with the previous units from this category, but give this little guy a chance. With its audio and vocal output, it is ideal for various applications ranging from classrooms to yoga and health clubs, but it can also be used for small auditoriums. It has a Bluetooth built-in, USB, micro SD card and mp3 player, all of which are very convenient. It doesn’t perform very well, but it feels better than expected. Of course, you won’t use it for throwing parties, but it can deliver when it comes to club meetings and similar venues. Besides the troubles with the volume, you might experience some malfunctions when it comes to the mic. These mini PA systems are clearly not made for audiophiles and performers, but if you are choosing one of them, you might as well choose the best. From where we’re standing, that is definitely Hisonic HS120B. When looking for the overall winner it is hard to compare some of these units, since they all bring very different things to the table. Essentially, it all depends on you and your needs. Judging by the power and other qualities, clearly The Rockville RPG122K takes the medal. The qualities it offers are too many for the price of this unit, so we see no reason not to give it a chance, today! What is your winner of these systems? Is there another one we should include in the guide? Let us know in the comments below!